James Madison Baskin Settled at Beaver Dam Creek. James Madison Baskin, first of the Baskin family to settle in the Ray City area, came to Berrien county about the time it was created in 1856. He was the grandfather of Armstrong B. Baskin, and great grandfather of Mary Frances Baskin. James M. Baskin was born 6 April 1829 in Houston County, GA, one of thirteen children born to Sarah Goode and James G. Baskin. His father was born 1792 in Abbeville District, SC. and came to Georgia as a child. When grown to adulthood, James M. Baskin left his family home with two slaves given to him by his father. These slaves were experienced in construction, and James went into business as a building contractor. About 1852, Frances Bell Knox and James Madison Baskin were married in Houston County. In 1853, Frances gave James a daughter, Fannie E. Baskin. Another daughter, Sarah “Sallie” E., followed in 1856. James M. Baskin’s father died in 1856. About that time he decided to move his family from their home in Houston County. His adopted son was now seven years old, his daughter three. His wife was probably either pregnant or was caring for their second infant daughter Sarah “Sallie” E., who was born that same year. Who knows his reasons for uprooting his young family? The Indian wars were over – south Georgia was secure. The Coffee Road provided a migration route and there was a steady southward flow of settlers. Perhaps the disposition of his father’s estate incited him to move. Perhaps he foresaw the coming war and wanted his family farther from north Georgia military objectives, or perhaps he saw more opportunities in the new counties being opened in southern Georgia. 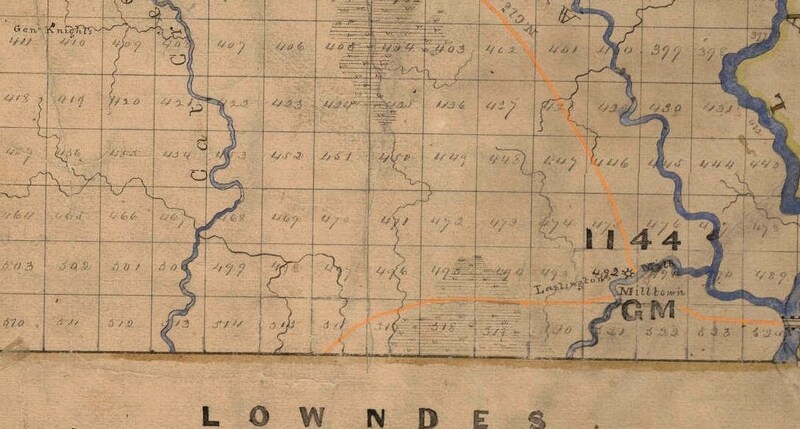 It was in 1856 that Berrien County was cut out of Lowndes County; Levi J. Knight and others were setting boundaries and surveying the new county. James M. Baskin brought his family to the area of Beaverdam Creek in the southernmost part of the new county. He settled about a mile outside of present day Ray City, GA on land Lots 470 and 471 in the 10th land district. Tax records from the 1870s show James M. Baskin owned 1080 acres pf land in Berrien county, relatively valuable land appraised at $1.85 per acre. 1869 Berrien County Map detail showing location of land lots #470 and 471. The Civil War came along and James M. Baskin joined the Confederate army, enlisting as a private in the 54th Georgia Infantry. He fought throughout the war and was wounded in the Battle of Atlanta. After the war, James Baskin returned to farm life. Over the next ten years he and Frances had five more children. In all, James M. Baskin and Frances Bell had 11 children. James and Frances Baskin, and some of their children, were active in the formation of Beaver Dam Baptist church, now known as Ray City Baptist Church. Baskin, Sarah “Sallie” E. (1856 – ) m. Thomas M. Ray, Jr.
Baskin, William H. (1869 – ) m. Mamie Harrell, dau. of John W.
Frances Bell Knox Baskin died on June 3, 1885 at Rays Mill (now Ray City), Berrien County, Georgia. James Baskin was a widower, 56 years old, the youngest of his 11 children just 9 years old. He decided to re-marry. Just six months later, on Dec 30 1885 he wed Mary Ann Harrell. She was a native of Lowndes County, born in Nov. 29, 1859. At 27, she was a prominent citizen experienced in public service, and a former Ordinary (probate judge) of Lowndes county. James Madison Baskin lived on his land near Ray City with his second wife until his death on July 7, 1913. Mary Ann Harrell Baskin died April 29, 1917. He and both of his wives are buried in the Ray City Cemetery.